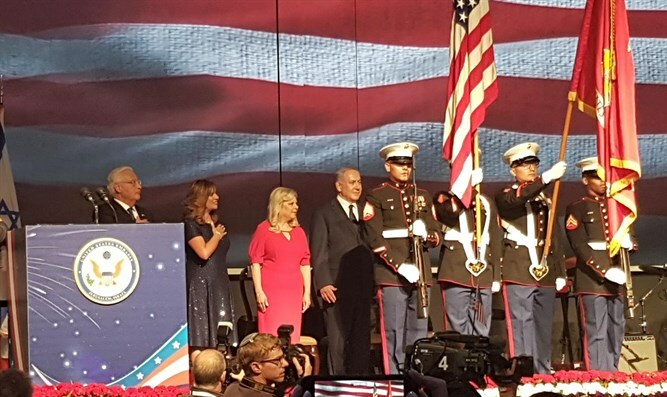 Netanyahu at celebrations of US Independence Day in Jerusalem: Israel grateful for America's independence and strength. The 242nd U.S. Independence Day Celebration took place at the Avenue Convention & Events Center at Airport City. The event included remarks by U.S. Ambassador to Israel David Friedman and Israeli Prime Minister Binyamin Netanyahu. The U.S. Naval Forces Band Flagship performed, followed by a performance featuring Maestro Nir Brandt. US ambassador to Israel David Friedman said during his address: "For the first time in its 242-year history, the United States of America is proud and grateful to receive happy birthday wishes from its embassy in Jerusalem, the capital of the State of Israel." The ambassador noted that the celebration was attended by Stuart Force, the father of US army veteran Taylor Force, who was murdered in a terrorist attack while vacationing in Tel Aviv in 2016. "The Force family was devastated by the senseless loss of their brilliant son. But when they discovered that American financial aid to the Palestinian Authority was being used to pay a reward to the family of the terrorist who murdered their son, that sadness turned into justifiable anger," Friedman said. "That anger was channeled into a political movement which led to the passage of the Taylor Force Act, signed into law by President Trump just three months ago, on March 23, 2018. It ensures that the travesty of 'pay for slay' will never again be repeated by the United States." Prime Minister Netanyahu called this year's celebrations of America's Independence Day "special" because they took place in the US embassy in Jerusalem. "President Trump moved the embassy declaring Jerusalem as Israel's capital," Netanyahu said. He praised Trump for defending Israel at the UN "day in and day out" and for withdrawing from the Iran nuclear deal. Netanyahu criticized the countries of Europe for working with Iran to circumvent US sanctions on the Iranian regime even as an Iranian plot to bomb a rally in Paris was uncovered. "Here is my message to the European leaders: Stop funding the very regime that is sponsoring terrorism against you and against so many others. Stop appeasing Iran. "This is what President Trump has said, but he has gone well beyond saying it. This is what he is doing. "We are grateful for America's independence," Netanyahu said. "We're grateful for America's strength. We're grateful for America's alliance with Israel." He said that the US-Israel alliance is based on the "common values" of "freedom, liberty, democracy."